Here we have a short stop-motion animated film from BrickNerd Studios. 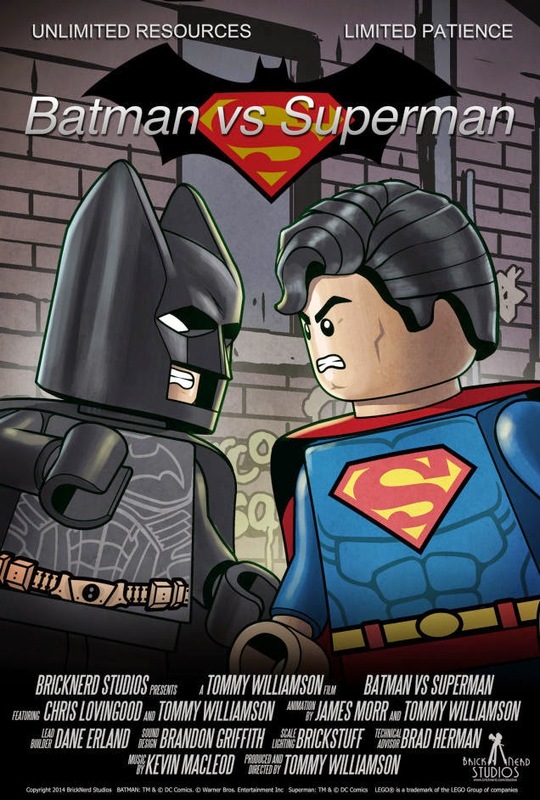 It is a confrontation between Batman and Superman called, appropriately, 'Batman vs. Superman.' It is done using Lego bricks. I know what you're thinking. 'Oh no, not another one.' Yes, these fan superhero shorts do get redundant after a while, and you kind of wish these kind of talented animators would us their superior skills for good (like, something that isn't just a throw-away?) rather than evil ('OMG not ANOTHER fan superhero confrontation animation.'). Yes, everywhere you turn on youtube there is another one, and the Lego genre is all but played out except by the big studios. But 'Batman vs. Superman' is done quite well, in a professional way. The stop motion animation by Tommy Williamson is seamless, the wit is sardonic, and the the music by Kevin Macleod echoes the pompous strains of superhero flicks that we all know and love. You must sympathize with the animators, they probably secretly want to do 'My Dinner with Andre' but they know where the hits are. 'Batman vs. Superman.' And if you know where the shark repellent reference comes from, you're a true Batman fan. Batman and Superman square off (for some reason) in this stop-motion animated short.